Daylam-jafarabad, M., Azadfar, D., Arzanesh, M. (2013). The ability to filter heavy metals of lead, copper and zinc in some species of tree and shrub. International Journal of Advanced Biological and Biomedical Research, 1(1), 53-60. M. Daylam-jafarabad; D. Azadfar; M.H. Arzanesh. "The ability to filter heavy metals of lead, copper and zinc in some species of tree and shrub". 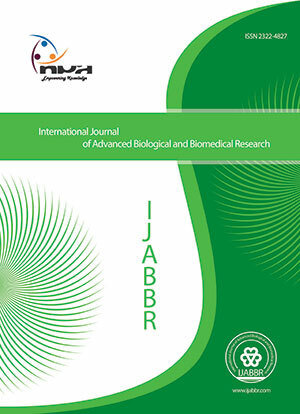 International Journal of Advanced Biological and Biomedical Research, 1, 1, 2013, 53-60. Daylam-jafarabad, M., Azadfar, D., Arzanesh, M. (2013). 'The ability to filter heavy metals of lead, copper and zinc in some species of tree and shrub', International Journal of Advanced Biological and Biomedical Research, 1(1), pp. 53-60. Daylam-jafarabad, M., Azadfar, D., Arzanesh, M. The ability to filter heavy metals of lead, copper and zinc in some species of tree and shrub. International Journal of Advanced Biological and Biomedical Research, 2013; 1(1): 53-60. Heavy metals found in urban air with its toxic effects have a direct impact on human health. Selection of appropriate tree species and shrub refining capacity of heavy metals in urban areas can greatly reduce the toxic effects of these materials. This study aimed to identify the most suitable tree and shrub species of broadleaf evergreen, deciduous and coniferous refinement of heavy metals lead, copper and zinc in the air in both units and total leaf weight. 12 species of tree and shrub leaves in City Park in Gorgan in summer (August 2010) was sampled. Heavy elements present in the samples were prepared and measured by atomic absorption instrument. The results showed that the performance of the trees in comparison to shrubs refinement of heavy metals lead, copper and zinc were more appropriate. Among the species present for purification of Pb and Zn, refine Shiraz, Magnolia and Cypress Pine copper refinery in Shiraz were the best and Tehran and Palvnya had the best performance for copper. Ali C, elika A, Kartal A, Yakup A, 2004. Determining the heavy metal pollution in Denizli (Turkey) by using Robinio pseudo-acacia L, Environment International 31, 105– 112. Beckett A, 1998. Effective tree species forlcal air quality management, Journal of Arboriculture. 26(1): 221-231. Djingova R, Kuleff I, 1993. Monitoring of heavy metal pollution by Taraxacum officinal. Plants as Biomonitors/Indicator for Heavy Metals in the Terrestrial Environment, Markert B, VCH Publisher, Weinheim, 435-460p. Khademi A, 2010. The role of deciduous tree species (sycamore and ash) in the reduction of lead pollution, Journal of Natural Resources Science and Technology, 5(1): 1-12. Nowak D, Daniel E, 2006. Air pollution removal by urban trees and shrubs in United Stataes, Urban Forestry & Urban Greening, 4:115-123. Rosselli w, Keller C, 2003. Phytoextraction capacity of trees growing on a metal contaminated soil, Plant and Soil, 256.265–272. Sengupta S, Chatterjee T, Ghosh P. B, Sarkar S, Saha T, 2011. Heavy metal contamination in leaves of Mangifera indica around a coal fired thermal power plant in India, Journal of Ecology and the Natural Environment, 3(14),446-454. Tomasevic M, Vukmirovic Z, Rajsic S, Tasic M, Stevanovic B, 2005. Characterization of trace metal particles deposited on some deciduous tree leaves in an urban area, Elsevier, V. 61, 753–760. Zare SA, Karimi S, 2009. Principles of Urban Forestry, Publications eyelids, 202 p.